The early 1940s found Clearwater residents concerned with the Second World War. Several large hotels in the area, including the Fort Harrison and the Belleview Biltmore were stripped of their luxurious furnishings and filled with army recruits, who were trained here to get acclimated to the beaches of the South Pacific. Locals did what they could to make the soldiers feel welcome, keeping their downtown stores open to accommodate the soldiers schedules, inviting the military men to events at the Municipal Auditorium and entertaining the officers wives at tea parties. Of note during this time was the development of the Roebling Alligator, an amphibious tank designed by Clearwater resident Donald Roebling. The tank was tested locally and used extensively overseas. This earned Mr. Roebling a Certificate of Achievement from the United States Navy. A military equipment display is the source of much interest on Cleveland Street in 1944. Military onlookers, transport vehicles, and even a Roebling Alligator are on hand for the occasion. Quoted from Clearwater a Pictorial History, by Michael L. Sanders, published 1983 by Donning Company. Also of note is the Detroit Hotel on the right of the photo. Built in 1920, the Brooklyn Dodgers stayed at the Detroit while in town for Spring Training in the 1920s. 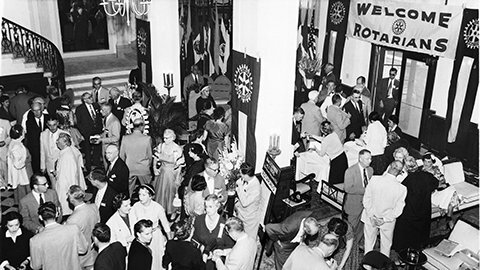 The lobby of the Fort Harrison Hotel was “activity central” for the Golden Anniversary of Rotary Club District #344 in this photo from 1955. The Hotel also provided springtime lodging for the Philadelphia Phillies, and was utilized by groups as diverse as the Professional Golfers Association and the Florida Peace Officers Association. After the war, some veterans returned to Clearwater, bringing their families with them, and Clearwater experienced another boom. Adding another draw was the establishment of Clearwater as the spring training home of the Philadelphia Phillies in 1948. By 1950, new subdivisions were being built, the Fun N Sun Festival began and by 1957, Clearwater was the second fastest growing city in the United States. The “Tri-city Fiesta” was held on Clearwater Beach in 1961. An effort to bring tourists to Clearwater, Tampa and St. Pete, the Fiesta included fishing tournaments, boat regattas, a beauty pageant and exhibition softball games by the World Champion Clearwater Bombers. 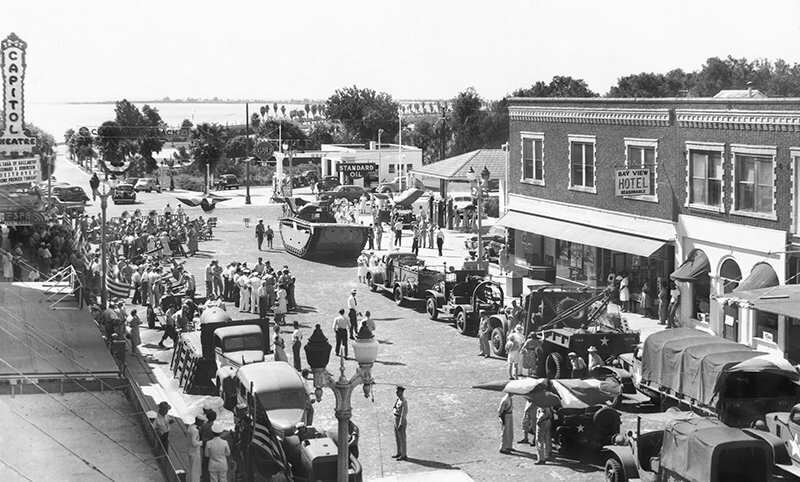 The event in 1961 brought record numbers of tourists to Pinellas County. Photo courtesy of State Archives of Florida, Florida Memory.